ScreenSteps Desktop 2.9 and Workgroup DocumentationScreenSteps Desktop & WorkgroupScreenSteps 2.9 Working with ScreenSteps LiveHow do I send a link to an article? 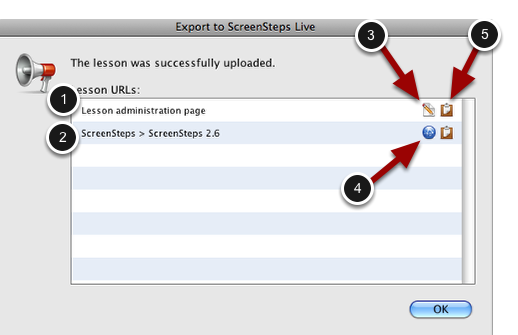 There are various ways that you can get the urls for lessons that you have posted to ScreenSteps Live. It is important that you keep clear the difference between space urls and admin urls. Use a space url if you want to send a link to a customer or user. Use an admin url if you want to send a link to another author or administrator on your account. Right after you upload a lesson you will see a dialog that looks like this. Here you can go directly to a lesson or copy the url to your clipboard. 1. This is the Administration url. Only Admins or Authors on your account will be able to access this. 2. If you have placed the lesson in a manual that is in a Space then you will see the space URLs. 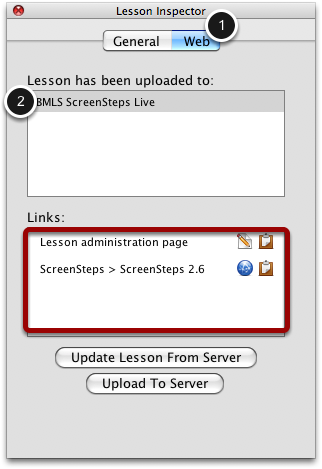 In this example this lesson is in the ScreenSteps 2.6 manual in the ScreenSteps space. 3. Clicking the Edit button will take you to the Admin page for the uploaded lesson. 4. Clicking the Space button will take you to the lesson page in the corresponding space. This is where you should send your customers/users. 5. Clicking the clipboard icons will copy the corresponding urls to the system clipboard, allowing you to easily insert them into an email or instant message. If you need to get the url later, open the lesson and select Inspect. 1. Select the Web tab. 2. Select the account where the lesson was uploaded. You will now see all of the urls for that lesson.